Are you doing the Lets Book It Challenge that Sharon is running at Vrooman's Quilts? 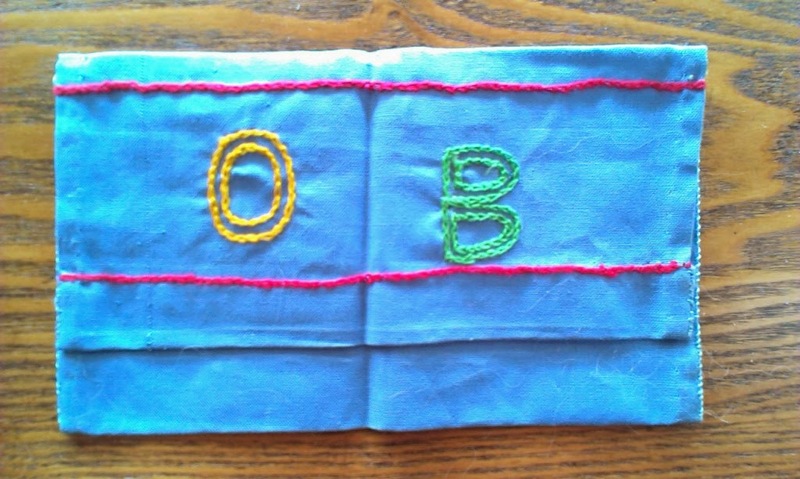 All you have to do is open a long forgotten book and make something from it. There is a link at the end of every month so that you can show off your prowess with the needle, and to see everyone else's of course. The first link will appear on 31 January, which will actually be 1 February here. Well that sounded pretty good to me as I have a shelf or two, or three, groaning with books from which I have never made a thing. I chose three books from my shelf a couple of weeks ago to browse for inspiration. One went straight to the charity shop - I can't imagine what was in that book I might ever have wanted to make. 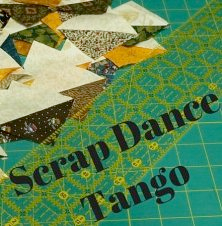 The second book has lots in it I would like to make one day, but they all rely heavily on me purchasing more fabric, and I am on a miser's mission at the moment. I need to use my stash. So that book went back on the shelf for another time. 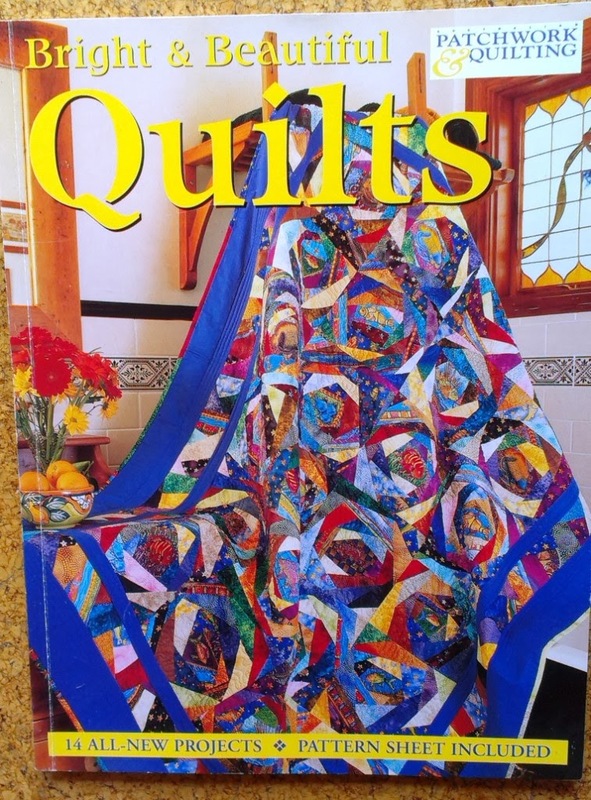 Bright and Beautiful Quilts by Patchwork & Quilting, published in 2000. If my memory serves me right I got it as a freebie gift when I subscribed to that magazine eons ago. Not sure if you can still buy it now. 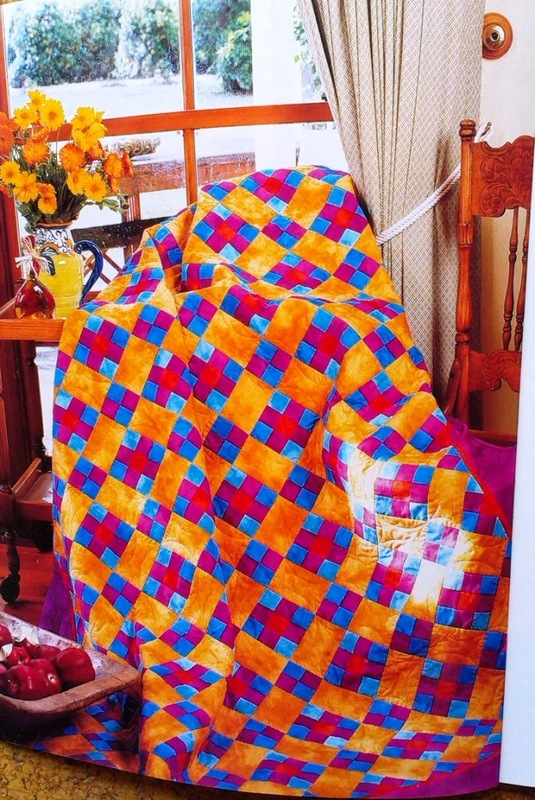 The pattern is called "Harlequin", and it is by Michelle Marvig. Now I haven't made it quite like that. Why aren't you surprised? I actually had a bucketful of 4-patches made with 3.5" squares, and another bucketful of 4-patches made up from 2" squares. Both lots made as leader/ender projects ages ago, and both looking for some inspiration to hit me on how to use them. So off I went last week and bought some cheddar tone on tone fabric. Should probably have gone with my gut instinct and bought orange, but this seemed OK at the time. Besides, I have never, ever used orange fabric in all the years I have been sewing and I was scared witless at the thought of buying some. LOL. 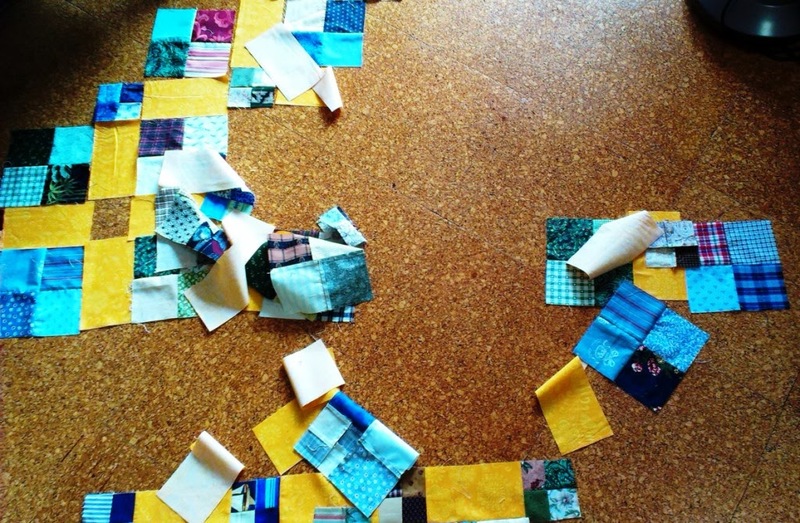 Chopped the sashing strips and laid them out on my design board, also known as the floor of my work room that night. 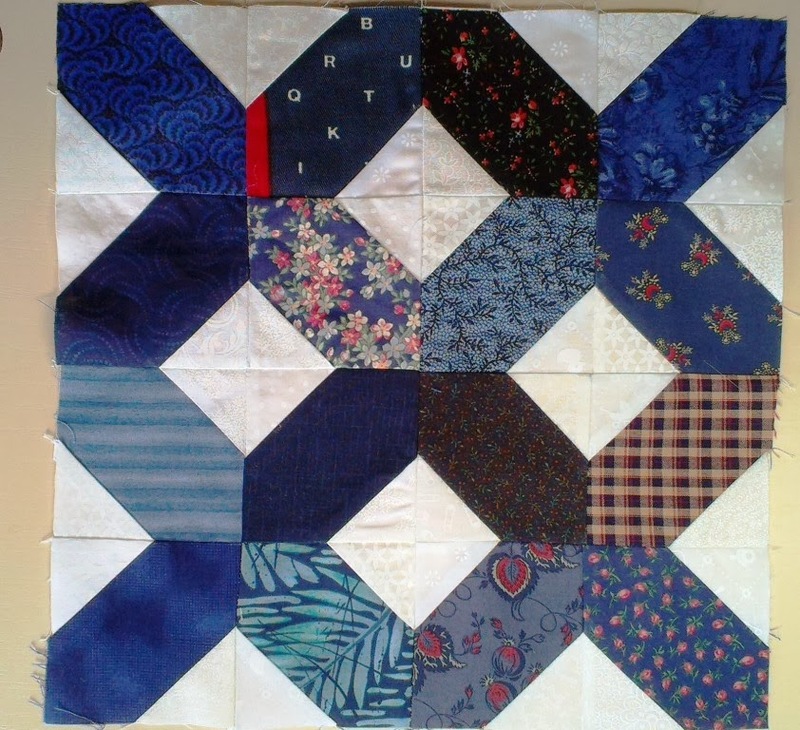 While piecing the 4-patches months ago I was actually angling for a "man" quilt for Stitching Hearts, so I used blues, greens, some dull reds and a few browns. The cheddar really lifted these colours, while still keeping to the original "man" look. The on-point layout gives it quite a different look. It has come together very quickly and here it is waiting for some borders. Now it is confession time. The pattern called for you to piece the triangles on the edges separately, but hey! 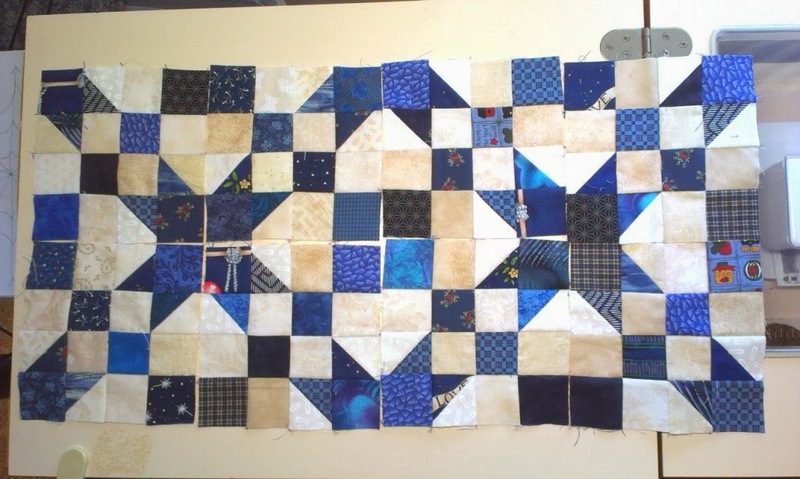 I am using up my scraps, and I already had the 4-patches pieced, so I just chopped the ones on the edges to the appropriate size after I had finished sewing the rows together. Doesn't look half bad, and I hadn't told you, no one would have known. Back a couple of weeks or so ago, I also decided to do the NewFO Challenge that Barbara runs at Cat Patches. (There is a sweet little button on the right side bar) The two challenges actually dovetail quite nicely. Now this is a simple challenge too. All that is required of you is to start a new project, no obligation to finish it! Too simple. And suits my style of quilting - a 1001 UFOs which I then have to work on diligently to complete. Perhaps next month I should try a little harder to end up with a UFO. If you want to know a little more about this project, I originally blogged about it here. 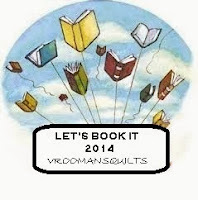 When the US catches up to us, and the calendar over there ticks over to the 31st, I will link this up to the Lets Book It and the NewFO linkys. Why not pop over to take a look at what other people are working on? 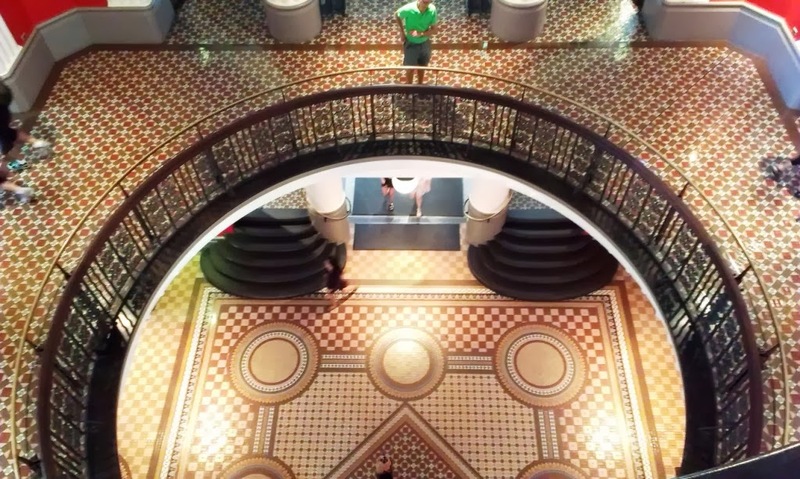 Today I want to take you on a walking tour of one of my favourite buildings in the heart of Sydney, the Queen Victoria Building (QVB). We visited just after Christmas. I have been there dozens of times, and each time I fall in love with it all over again. The building covers an entire city block and is bounded by George, Market, York and Druitt Streets. 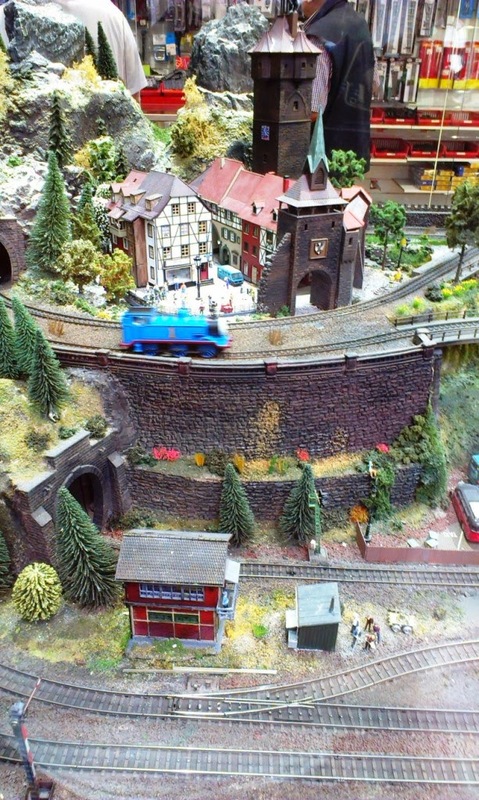 I had to filch this photo from the web, because we actually entered the building via a tunnel from Town Hall station, and I forgot to go outside to photograph the exterior! This is taken from Town Hall and you can see the Royal Wishing Well on the left and Queen Victoria's statue on the right. York Street is on the left of the building and George Street on the right. Druitt Street is directly in front. If you are wondering why the domes are green it is because they are made of copper. The site has been a market since the earliest days of Sydney. The book "Picture of Sydney and Strangers Guide in NSW for 1839" by James Maclehose mentions it as the New Market on page 68, and the Plan of the Town and Suburbs of Sydney August 1822 reproduced in "This Was Sydney" by Suzanne Mourot clearly shows the market lying opposite the Town Hall. 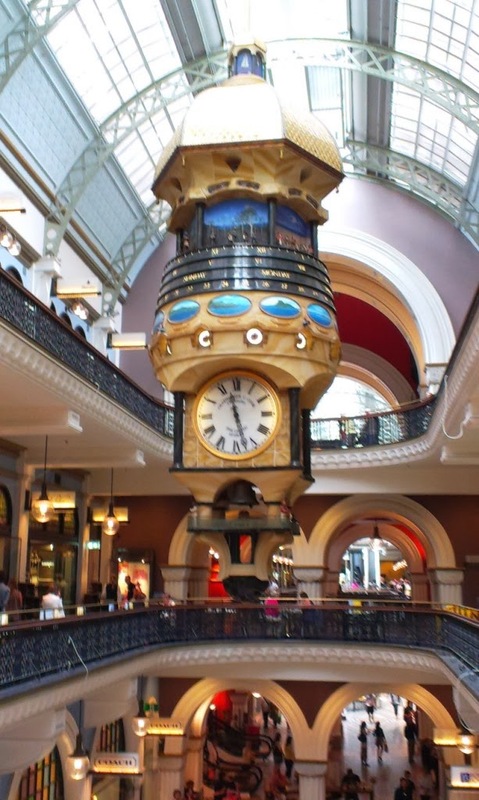 The QVB, was designed by George McRae and completed in 1898, replacing the original Sydney markets. It was built during a severe recession in Sydney by a Government which wished to create jobs for out-of-work craftsmen such as stonemasons, plasterers, and stained window artists. It originally provided for a concert hall, coffee shops, offices, showrooms, warehouses and a wide variety of tradespeople, such as tailors, mercers, hairdressers and florists. You can read a bit more here. 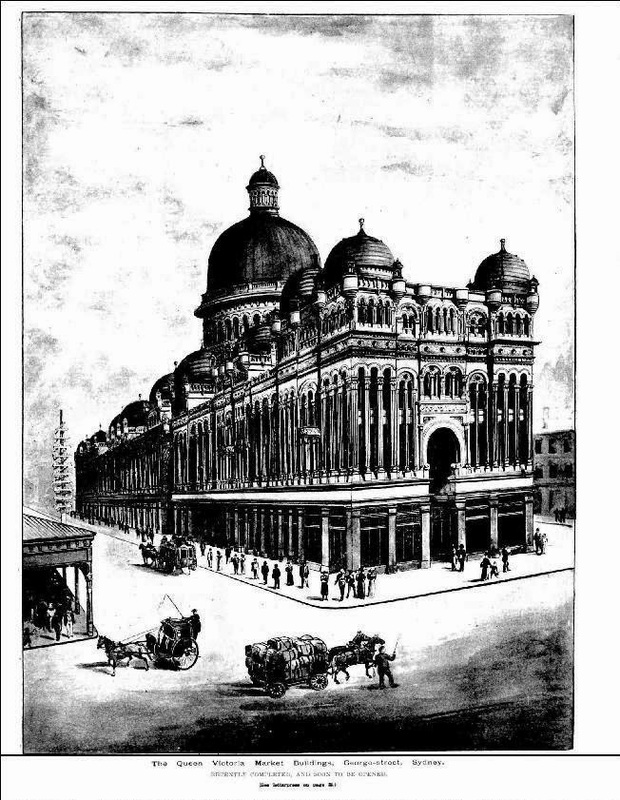 One of the occupants in the early years of the QVB was the Singer Manufacturing Company. 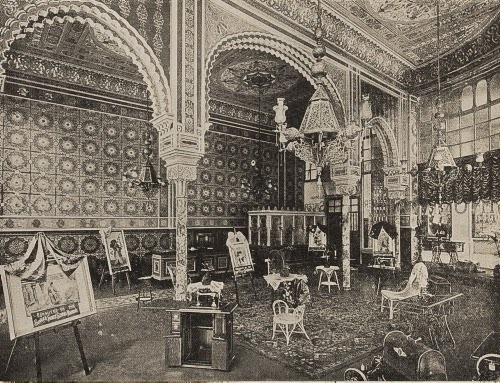 The image below is their showroom in the QVB in 1898. Can you see the treadle machine in a cabinet centre front? Another machine cover is bottom right, and there are at least two more machines on the right and to the rear of the show room. But back to the present. There are a number of stunning features in the building. One of the most famous is the Royal Clock, which has a performance every hour, beginning with the music of the Trumpet Voluntary by Jeremiah Clarke (love that!) played by miniature trumpeters who pop up from the top of each of the clock's four turrets. If you don't know that piece, there is a YouTube video here. 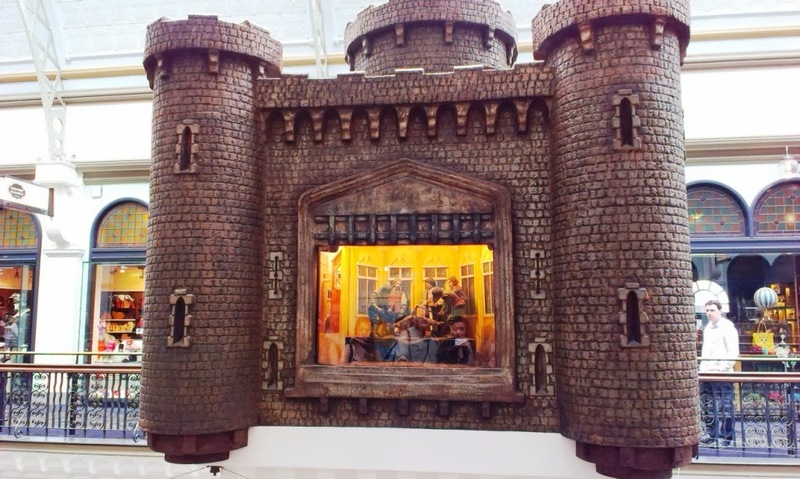 After the trumpeters finish, there are 6 scenes in the form of dioramas which display an animated scene from English royal history. The window lights up, the scene is presented, the light dims before the next scene is displayed. Some of the scenes are gruesome - the beheading of Charles I for example. The second clock is the Great Australian Clock, designed and made by Chris Cook. It includes 33 scenes from Australian history seen from both Aboriginal and European perspectives, just under its roof. An Aboriginal hunter circles the exterior of the clock continuously, representing the never-ending passage of time. 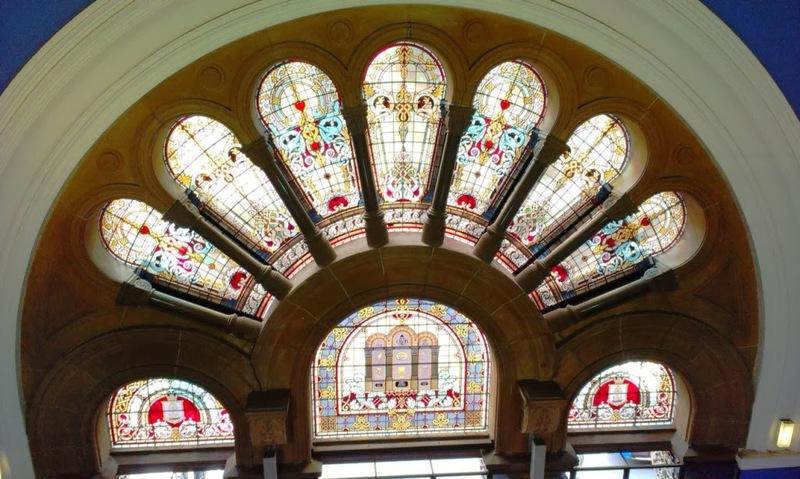 These stained glass windows form an arch above one of the main entrances and depict the arms of the City of Sydney. 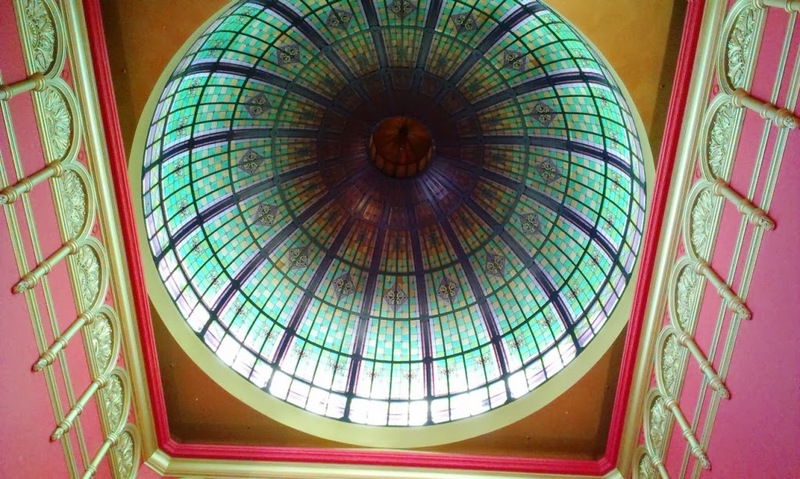 The central dome consists of an interior glass dome and a copper-sheathed exterior, topped by a domed cupola. Check out the ornate plaster work! 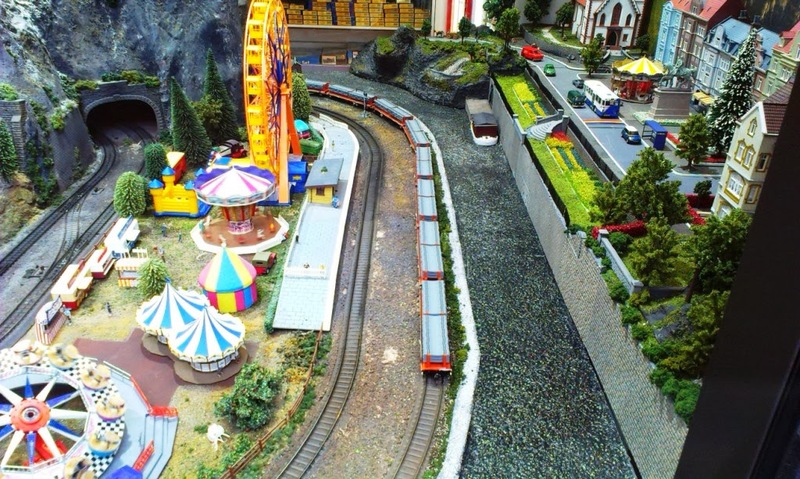 Much more contemporary is the elaborate model railway built behind a glass partition in the HobbyCo shop. Here is Thomas the Tank Engine on his relentless journey around the track. And on the other side, the fun fair, complete with rotating round-abouts and ferris wheels, facing the little town on the riverbank. The goods train is going by, and there are little boats on the river. I must be in my second childhood, because I stood there transfixed for ages! 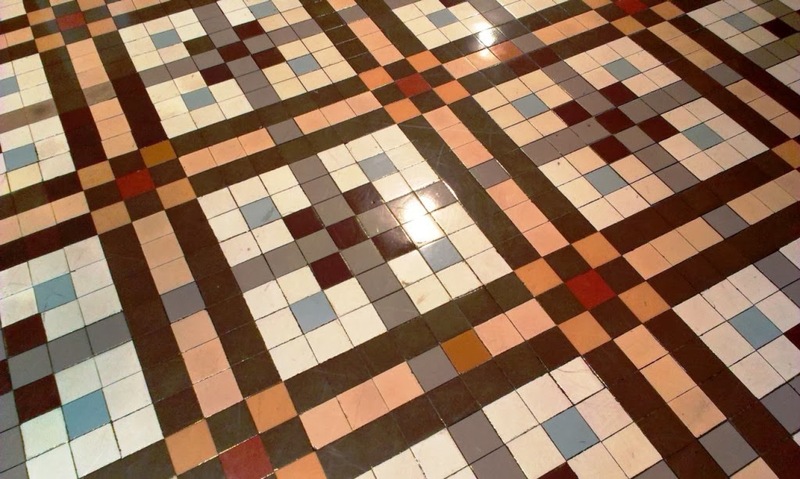 And then there are the tiled floors, mostly original. 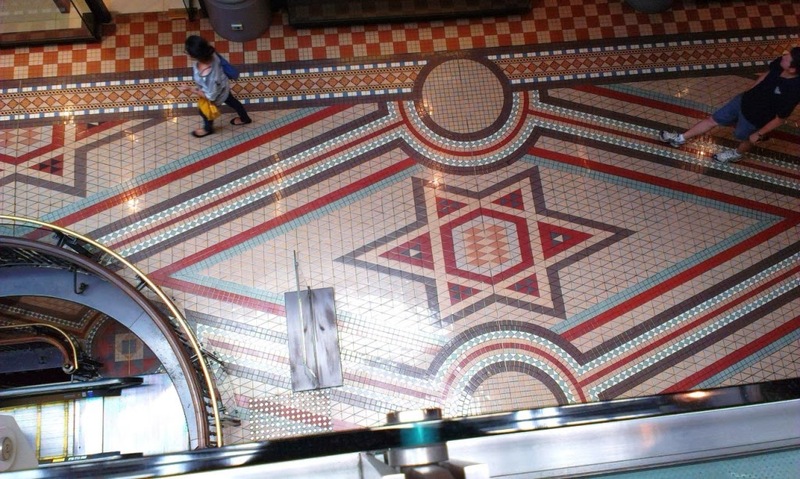 This is looking down from the second floor to one of the entrances on the ground floor. 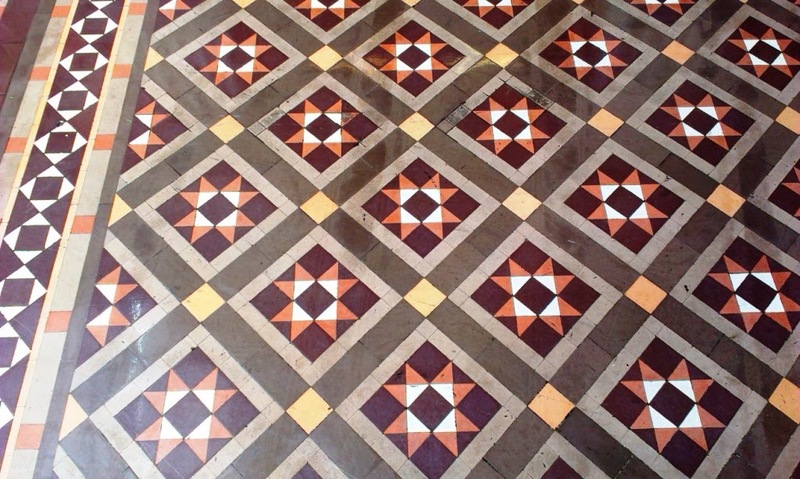 Stunning tiling! And from the escalators going from the third to the second floor - you can see all the way down to the basement level. Each floor has a different tiled design. 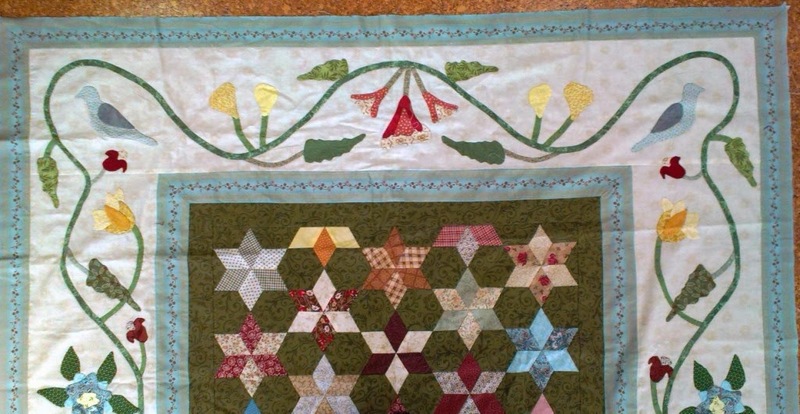 And look at these quilt borders? There is also a wonderful lift with old fashioned iron lace, and the original machinery still visible, but immobilised. I couldn't get a decent photo of that. So that is my favourite city building. There are others I like, but none are a patch on this one. Hope you have enjoyed your little tour with me today. 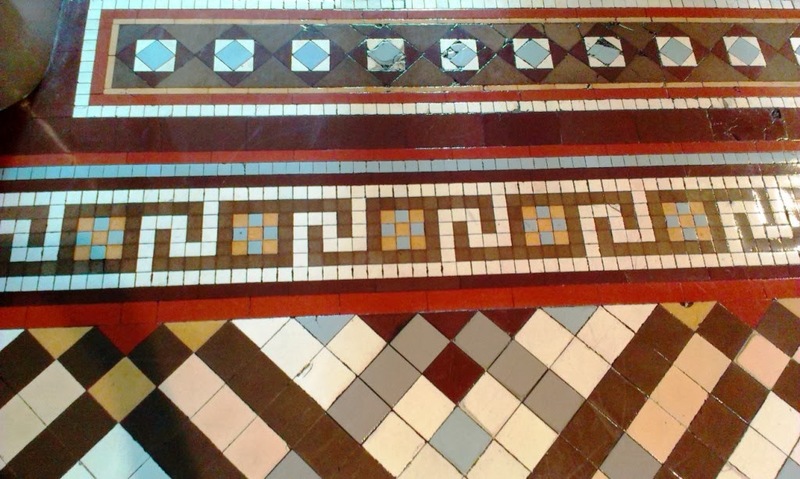 Labels: QVB, Royal Clock, tiled floors. I have been totally out of whack this week because I joined the Grow Your Blog link up which Vicky has organised. From my point of view it was great fun - I have visited a lot of blogs, and have "met" a lot of lovely people. My followers have also doubled. Woo Hoo! Thank you all for joining in with me. It's always a stress to link up with a blog which is organised on the other side of the world, because of the time differences, and this week because of the GYBP I am writing this on Monday, instead of Sunday. But it will still work, because I think its still Sunday in the US. Complicated?? You betcha! I want to link up this week with the Slow Stitching Sunday link at Kathy's Quilts, and so I am going to introduce you to my VERY slow stitching project. It was a donation to the Stitching Hearts eons ago. 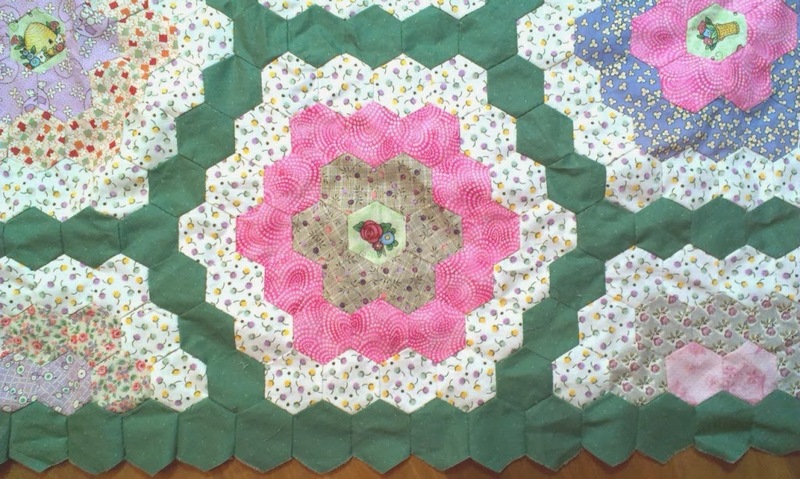 A hand pieced (not EPP) hexagon quilt with 8 completed rosettes, one half finished one and pile of the fabrics - enough to finish the project. It sat in the cupboard for ages, with me desperately hoping someone else would pick it up to finish it. Not a chance! I hate wasting fabric! And the thought of chucking what has taken someone a long time to do, albeit unfinished, just grates with me. So it finally came home with me some time mid year last year. My trusty helper insisted on helping me lay out the blocks of course, tee hee hee. 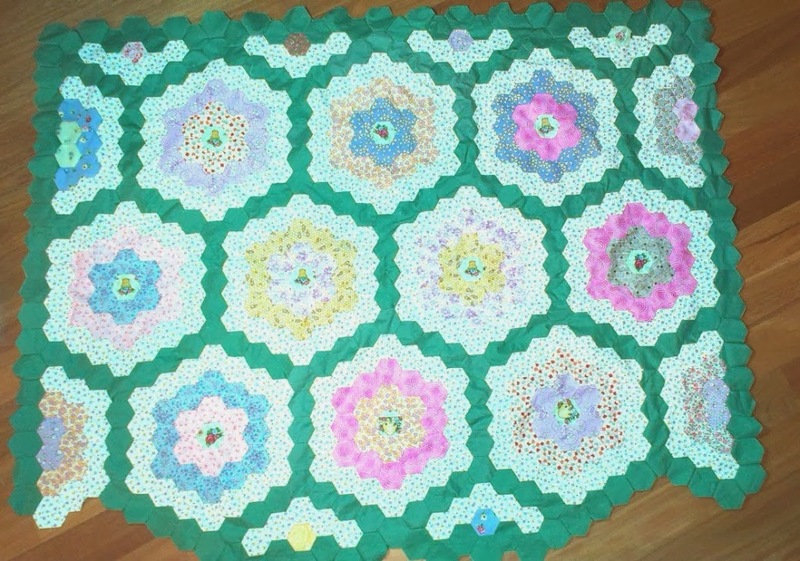 Most the of rosettes had been pieced together, with a lot of the green connecting hexies not yet added. Since then, in between other things, I have completed all the rosettes, and pieced them all together. As you can see on the lower edge, the edges looked "chewed", when I finally got all the rosettes put together, and the sides were heaps worse. 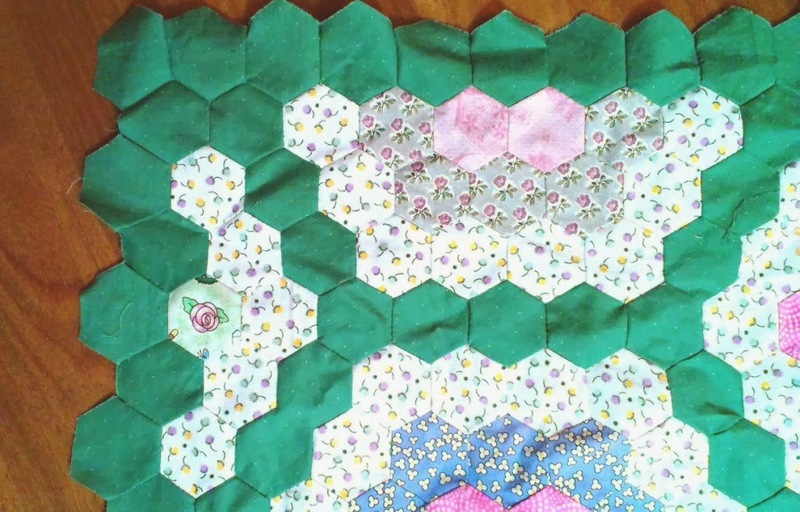 So I downloaded a hexagon planning page from Quiltmaker.com (what a find!) and planned out some filler bits to go around the edges to square it up a bit. As you can see, they are weird shapes! 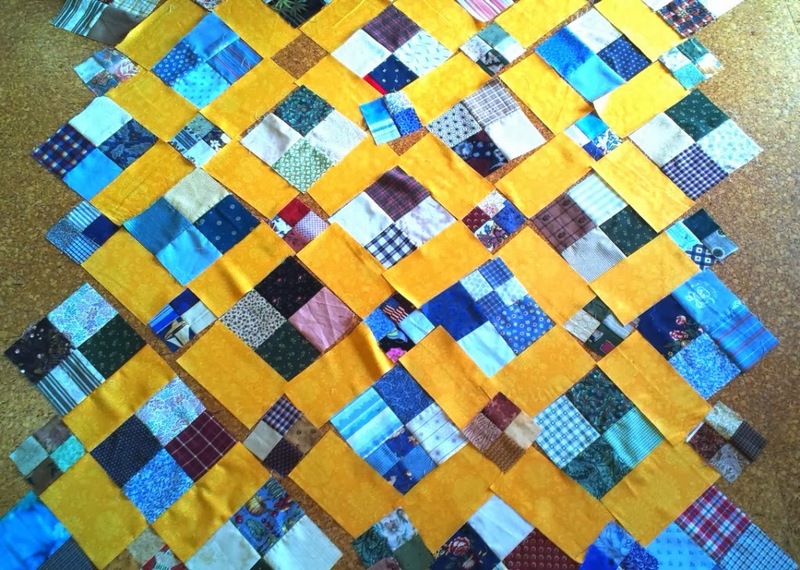 Last night I fitted in the last of the larger filler sections in the top of the border above, and finished piecing it in. I now only have 2 more side ones to do to fill in the gaps along one side. So that has been my slow stitching for many months, most nights, not just on Sundays, in front of the TV. Needless to say, if there has been something else to do, I have not wasted time picking it up. LOL. I have 3 minutes to link up at with the Slow Stitching Sunday link before it is Monday in New York! Today is Australia Day here. We celebrate the day the First Fleet arrived in our beautiful country, in what was then known as Port Jackson, on 26 January 1788. Today Sydney is a thriving metropolis, and a wonderful place to visit. I won't bore you with a history lesson. If I have piqued your interest, Wikipedia has an entry here. What it means is that we have a public holiday tomorrow. I have been busy this morning visiting a few blogs for the Grow Your Blog Party, and replying to all the lovely people who have stopped by and left me messages. Thank you! Thank you also to the people who are new followers of my blog. you are appreciated. Yesterday (which is today in US time) was the last Saturday of the month, and that means a linky party going on which Angela runs at soscrappy - the Rainbow Scrap Challenge. I thought I would tell you what I have made this month for that. First up I made 8 x 6" x 6" Road to Oklahoma blocks. I first talked about them here. Love that block! Love the secondary pattern of stars. Then I made one block which has finished at 12.5" - it used 25 x 3" squares. Good one! I showed it to the world in this post. 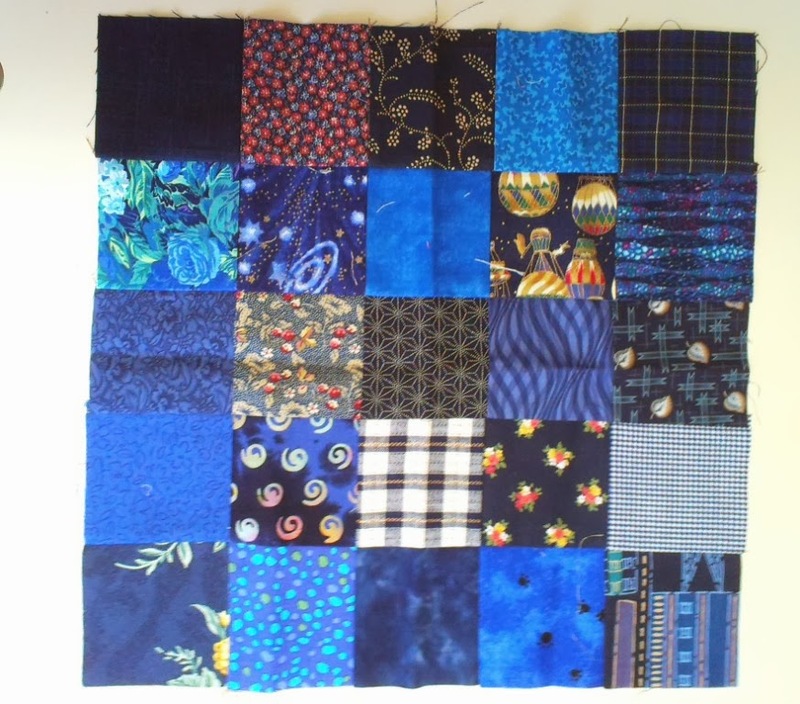 which, when sewn together make up a 12.5" square. 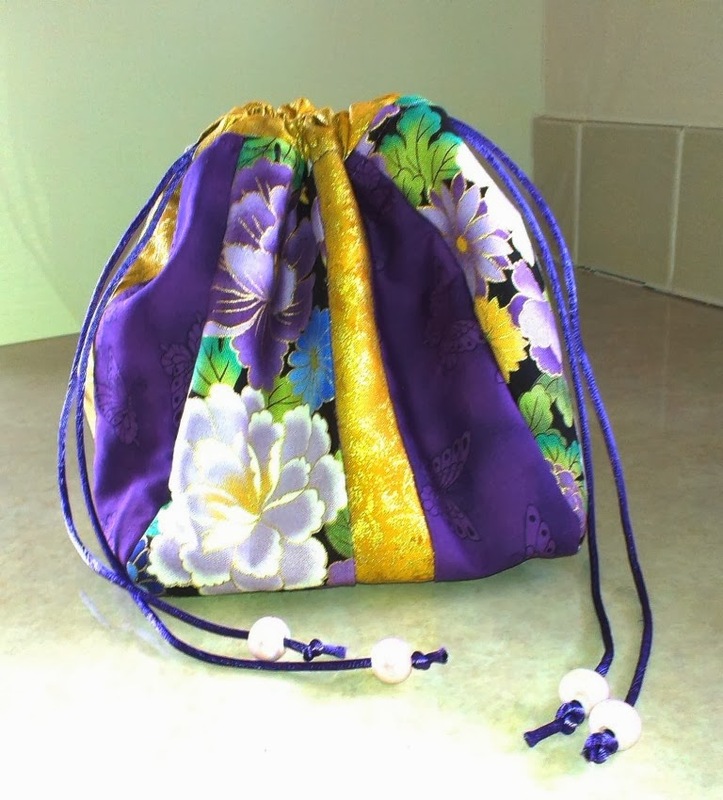 I made these from a tutorial here, which Sarah of SewMe has put together. Thank you Sarah! Such an easy block, and looks great. Now I am thinking, its only the 26th, so there might still be time for me to put some more blocks together before the end of the month. Ummm. What shall I do? Make some more blocks, or go back to the UFO's I have been working on? Decisions, decisions, decisions! What do you reckon? Have you seen the Rainbow Scrap Challenge before? It is such an easy, happy, challenge. 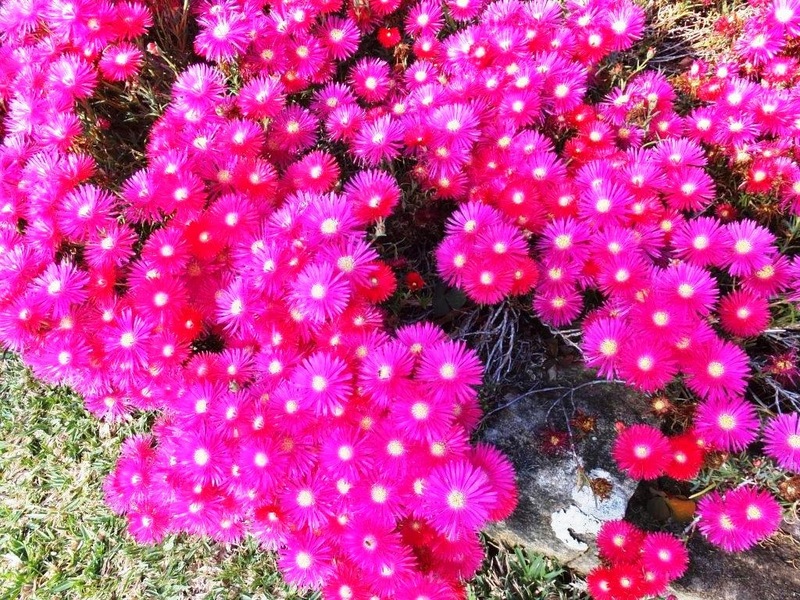 Angela picks the colour each month (January was blue). You don't have to sign up, there is no obligation. You make as many blocks as you wish, and hopefully there will be sufficient blocks at the end of the year for a rainbow quilt. 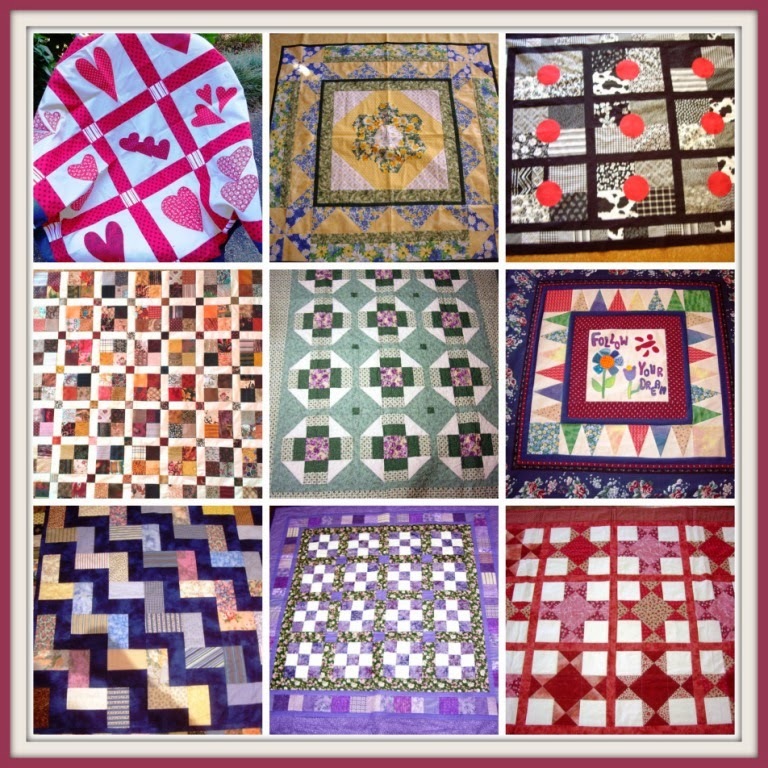 In my case I am aiming for 3 quilts, which will ultimately find their way to my charity group, Stitching Hearts (link on sidebar at right). Why not head over at take a look at the RSC14. And I have to go add my link, and look at what the others have made. Hello regular visitors, and a big welcome to anyone visiting from the Grow Your Blog Party. 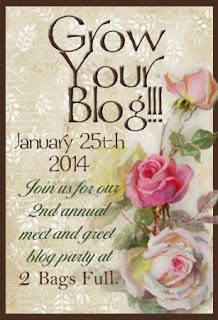 The idea of the Grow Your Blog party is to grow your blog!! It is hosted by Vicki, without charge, for anyone who wishes to participate. This year there are over 500 people participating. What a load of work that girl has taken on. 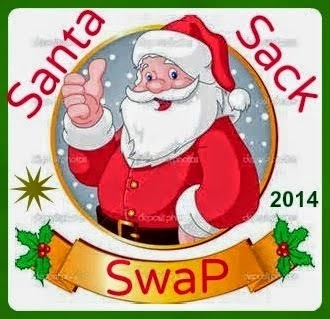 A huge thank you to Vicki for devoting the time to do this. and stuff that goes on around me. 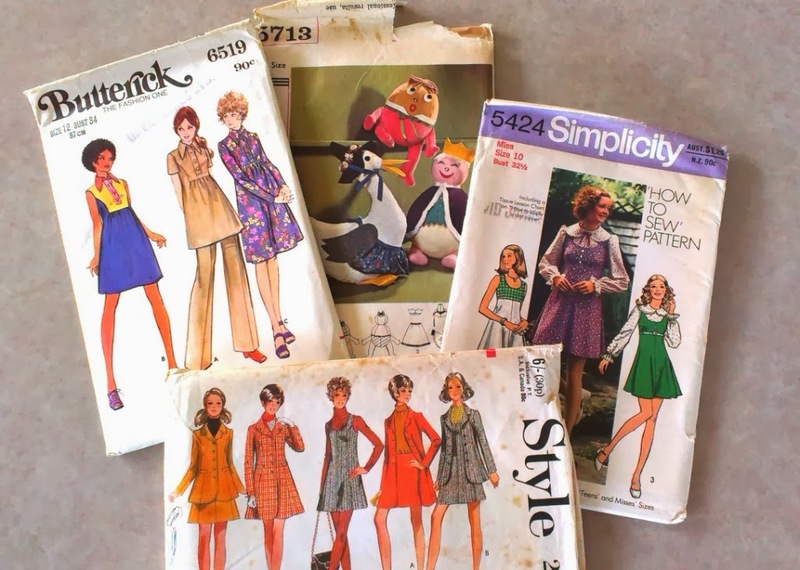 I began sewing as a child of about 5 or 6, when I made clothes for my dolls. I progressed to making dolls clothes for my daughter when she appeared, and these days I make them for the grandies. 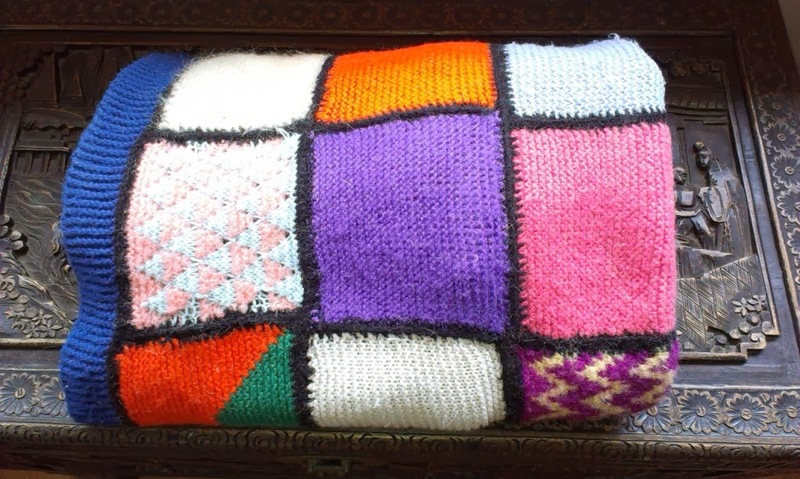 and a knitted blanket completed when I was 17, and still use some times. 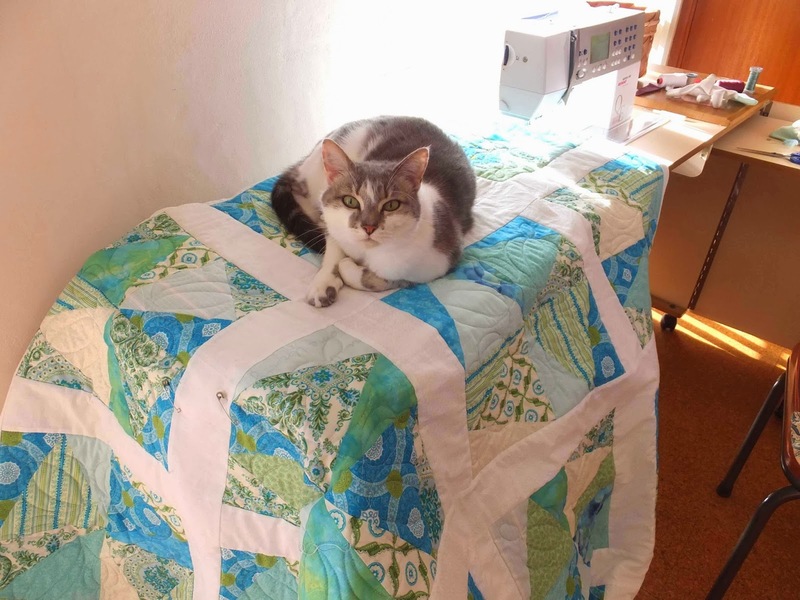 My crafting world changed in 1988 when I discovered patchwork, and since then I have outfitted the entire family, including in-laws and out-laws with quilts. 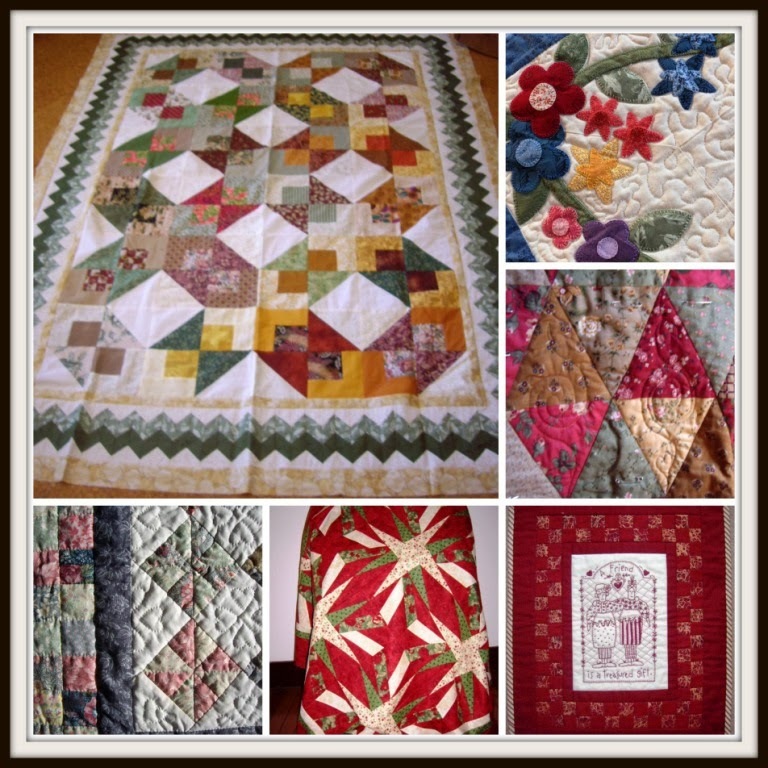 There are numerous babies and friends strewn all over the world who have something quilty made by "auntie Dasha". Now most of my sewing is done for the charity group I sew with, Stitching Hearts. 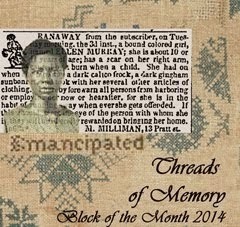 I discovered Blogs about 18 months ago, and launched into one of my own in January last year. I love blogging. 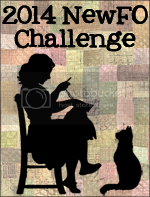 I love reading them, writing them and participating in bloggy challenges. Thank you for visiting, and I hope you will pop by again some time soon. 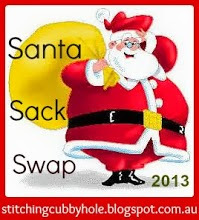 And remember to wander over to 2 Bags Full to visit some of the other players in the Grow Your Blog party. After filling up, the girls all headed for the spare room where the toys are. Its a long time since they have played with the toys I have, and its just as well I haven't given them all away. They had the chalkboard up and the little chairs ranged around it. Miss 12 was the teacher, the others the pupils, and she was setting them Maths tests. Precious! One of my gifts was a bundle of orange fat quarters. A couple of weeks ago I was looking for some orange fabric, and realised I had none. I actually bought some yardage for a project the other day at Craft Depot, and was surprised at how drawn I am to orange. How does that work? 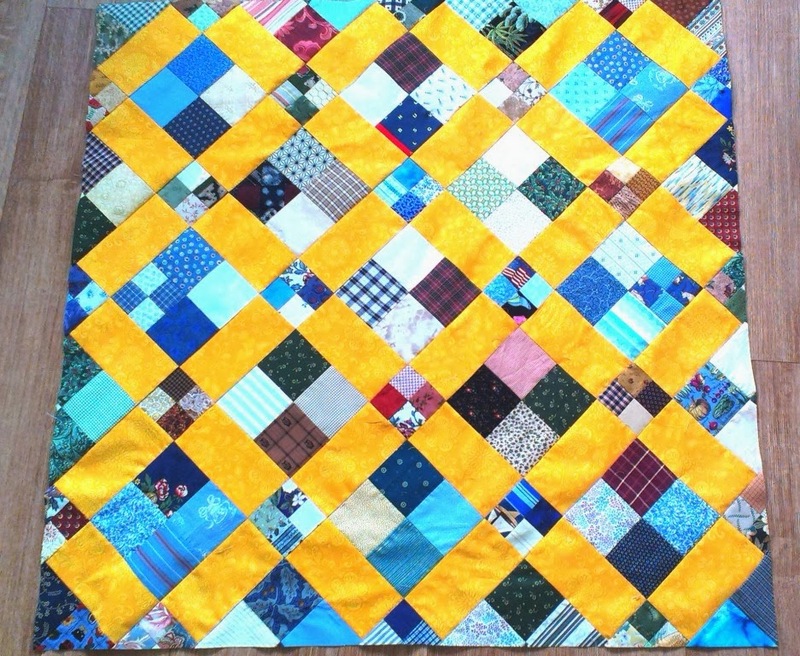 Years of quilting, and avoiding orange, then suddenly I want every orange fabric I lay my eyes on. Yesterday I saw Mother Duck with 6 little ducklings puttering around across the road. They had ventured out from the waterfront for the first time. She was too far away and when I tried to approach her for a photo she took off quick smart with babies in tow. Today I saw her again, and this time I zoomed the camera as far as it would go to take these photos. Babies in a huddle having a snooze, and she has her head up on guard. 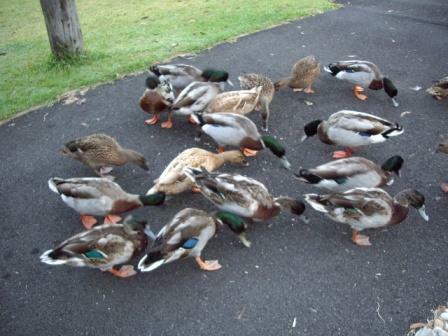 And then they scattered foraging for food in the grass. Aren't they just too cute? I finally got the border on the Hand Made Quilt. I can't keep calling it that - got any suggestions as to what I should name it? The original is called English Autumn, but I can't call it that as it is radically different from the original pattern. 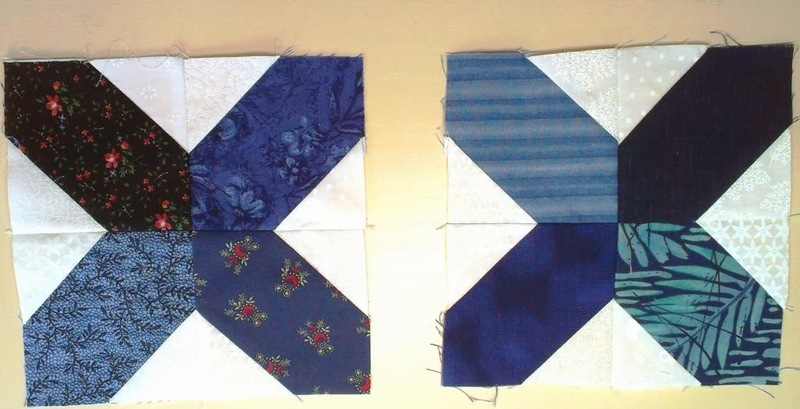 I have pieced two of the pieced borders - top and bottom. Here is one ready to go onto the quilt top. The pieced borders were still too long, despite much figuring and roping in of my Dearly Beloved (the DB has an honours degree in Maths from Oxford). So I unpicked the middle seam and took off a quarter inch on the two blocks, and resewed that seam. Looks OK I think. This afternoon my DB & I went to see The Book Thief. I really enjoyed the film, despite it being quite sad. I really can't imagine why it has had such poor reviews. Have you seen it? What did you think? And tonight I am babysitting. So I have brought my machine and am going to try and get some of the sashing on the Broken Dishes blocks I have been piecing. With a bit of luck I will have some photos next time. Ta Da!! I have drawn the Give-Away. The fifth comment on that post was Kerrie (Creations1). She blogs here. I will be sending you an email Kerrie for your address so that I can post you your prize. Congratulations! Thank you to everyone who visited, and everyone who took the time to post a comment. I really enjoyed reading about the birds who visit you regularly. Have you entered my Give-Away? There are a few hours left until it closes. 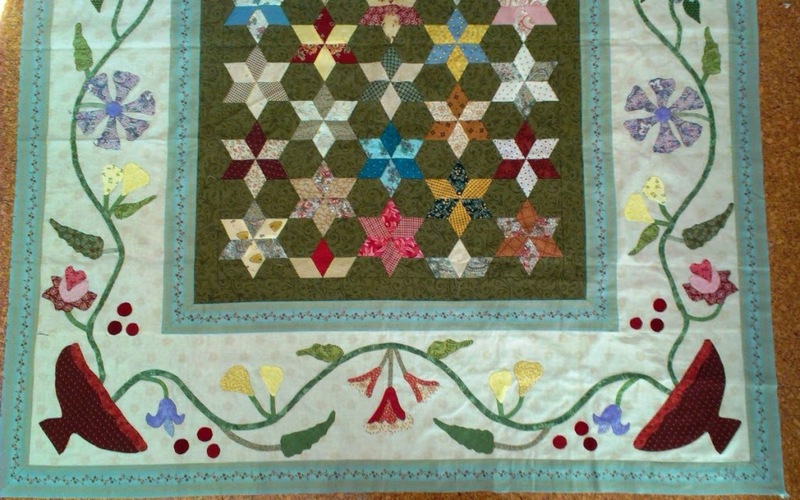 Today I thought I would share with you the story of my hand pieced quilt, well it is semi-hand pieced! I pulled it out yesterday determined that it would get finished, but the borders are defying me. I started it about 5 years ago. I wanted a challenge - this was pre-blogging days and I was sadly lacking n inspiration and challenges, so I booked into a course with Karen Cunningham. You can see her blog here. Karen teaches hand pieced quilts with loads of applique. Now I love applique, and had not done much for a while so decided this would challenge me. It was definitely a challenge! 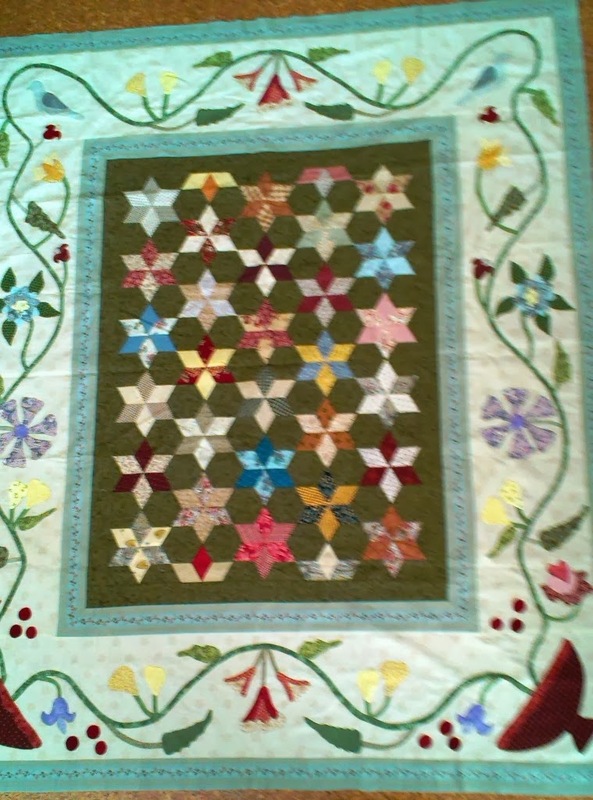 I chose a design she calls "English Autumn", with hand pieced stars in the centre medallion and a large appliqued border. But I soon realised that her original design was queen sized and I had buckleys of ever getting that finished. So I modified the design to make it much smaller, and it should finish up at single bed size. That of course meant I had to change the design of the borders to fit....... You know where I am going with this don't you. I found a gorgeous border print to go around the centre medallion. Here is where I cheated - I have sewed all the borders on by machine. And here is the applique border on, with another round of the border print around it. Now this is where I have come to grief. With the border print added, the quilt width and length is a stupid size because the print is not a neat 2" or 3" in width. So I thought I would add another round of the green fabric to make it up to the size I need for the next border which is already pieced. 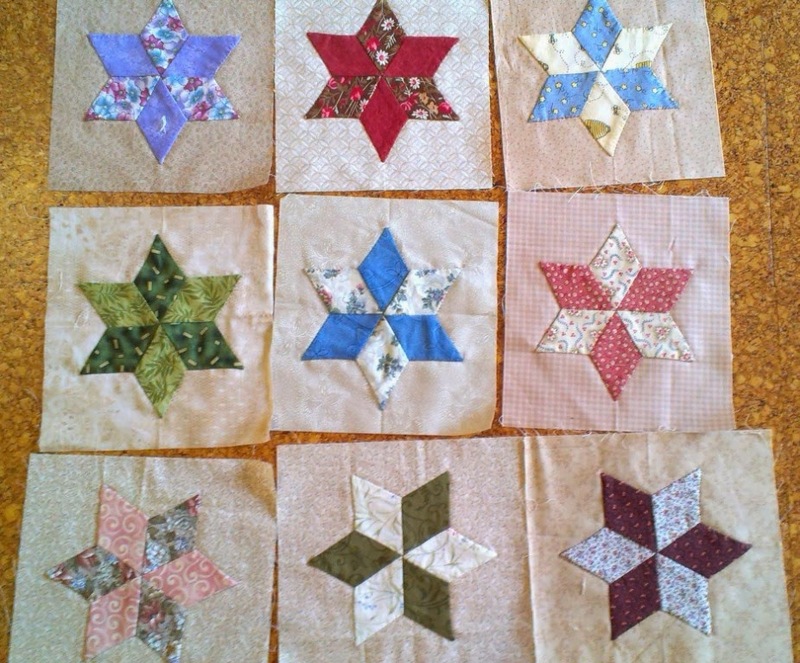 I have hand pieced a bunch of stars echoing the medallion centre, and have put them onto scrappy soft beige/coffee 6.5" in height and 7" wide sorta squares with the intention of cutting these to the right width, once I work out how wide they need to be. There are enough of those to go right around the quilt. I want the border to be 6" wide finished. 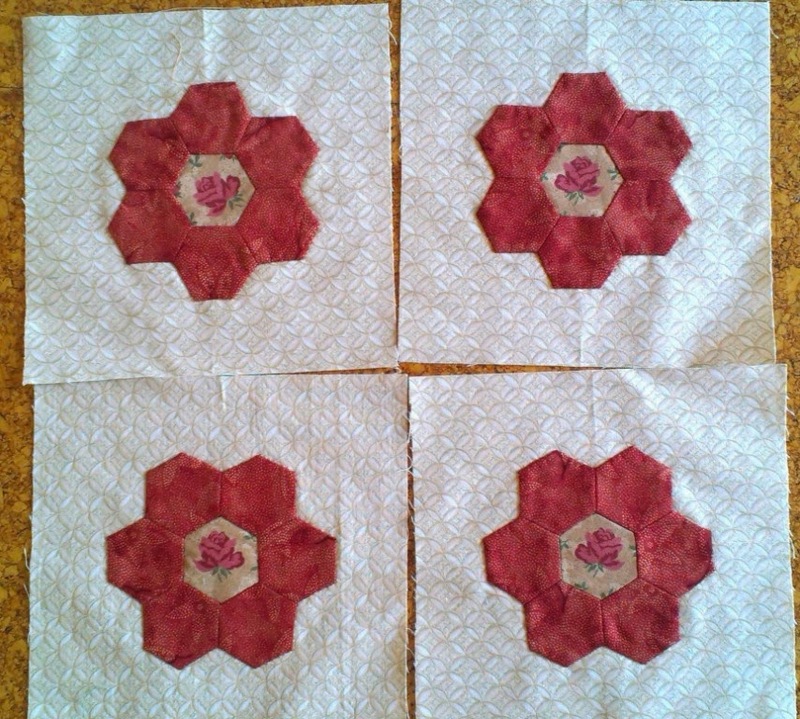 And four hexie flowers to go in the corners. But do you think I can work out the length of the dratted borders once they are pieced, and therefore the width of the green I need? I have been tearing my hair out trying to work that one out. Oh for a little gremlin to wander into the door and just tell me what to do!! Is it my eyes or are the photos terrible?? Rainbow Scrap Challenge 2014 Begun!